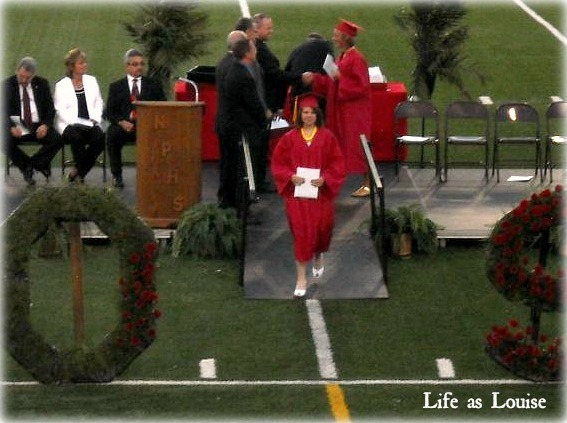 Last weekend I attended my high school alma mater graduation ceremony to watch my cousin receive her diploma. After listening to the graduates give some speeches (which were insightful and smart) I decided that I’d pen a little letter to the graduating class on my blog this week. Then I changed my mind. Then I found this post by Kelly Lorene & I was inspired. pre-college, marriage, and adulthood Audrey… bold necklace choice, kid. What kind of student you were in high school (popular, nerd, sport obsessed, choir, etc)? I spent all four years of high school living in the band room. Socially that might’ve made me a nerd… but I never felt like I couldn’t say hi to the “popular kids” or partner up with a non-band kid in the science lab. I had a core group of best friends in band but I had many friends outside of the music world that played sports, sang in the choir, or participated in other activities. About your school. Was it private? Public? How many in graduating class? Mascots? School colors? I attended a public school. I think there were about 230 kids in my graduating class. Unless they were super new or in and out of the building, I knew everyone’s name. (I assume everyone knew me, too.) Our school colors were/are red & black and we were “The Quakers.” Yep… like the guy on the front of the oatmeal box. About some of your favorite memories of high school or what stands out the most. Any teachers? Specific classes? I think all my memories center around band and band trips. I remember my first WGI World Finals experience. I remember marching in a parade in Disney World. I remember visiting the “Top of the Rock” in NYC. For most of high school I had three best friends and I have so many memories with them. Those are bittersweet since we’re not really friends any more. A piece of advice you would pass on to your children or any child entering high school. I would advise them to be nice. Teenage years are hard and when I think back to moments that I’m not so proud of it’s the times that I was unkind. Be nice to your friends and the kids that aren’t so popular. Be nice to teachers and administration and your parents. If all the fish in the sea aren’t being nice, swim the opposite direction and show some kindness. Also- these four years are meant to be fun and educational. Pay attention in biology. Break curfew once or twice. Learn how to do laundry on your own. Take these four years of child-adult limbo and learn a few lesson. A piece of advice you would pass on to your children or any child exiting high school. To be 100% honest, it gets harder from here on out. But it’s also so rewarding. Whether you go off to school or the military or join the workforce or start a family- work hard and show some grace (toward yourself and others) and don’t be afraid to treat yourself. The world will try to convince you that you’re not good enough: as an employee, as a mother, as a boss, as a father. You are good enough, but you have to work for it. Surround yourself with good people. Strive to make a difference. Don’t forget to breathe. Quite frankly, those questions were more fun than a letter 🙂 How would you answer them? Fantastic! Totally stealing, I mean, borrowing this post. Your words of wisdom were spot on. Being nice is truly one of the best pieces of advice to give. I floated amongst the “cliques” and had friends in many groups. You know what I’ve discovered; the so-called “nerds” are the people that are the most interesting to me today and the friendships that I’ve rekindled. Borrow away, lady 🙂 I wish I had someone beating “be nice” into my head every day in high school. I wasn’t a total jerk, but I could’ve used the advice. I am going to tattoo that into the brains of my future children/nieces/nephews! I have two close friends now that I graduated with. One I was close with on and off in high school and the other one I got close to once we’d graduated. It’s crazy who you stay connected with or reconnect with post-high school! Love this post idea! Love your words of wisdom! I had a super close group of friends in high school too, and my memories are also bittersweet when it comes to them. Ahh, doesn’t it sting a little?? I live in my hometown so sometimes I drive past places and think, ‘We used to hang out there!’ Losing friends is a weird thing (but sometimes necessary for growth). Love this blog post idea! Your words of wisdom are spot on. What kind of student was I? Book nerd…maybe? Favourite Memory – Terry Fox Run before Andrew and I started dating – it was a beautiful sunny day walking in the sunshine and we were being silly and fun. Advice – Relax, enjoy your time. You don’t have to have EVERYTHING planned for your future by Grade 12. You will change and your plans will change and that’s alright. Grade 13?? That’s weird… And those colors sound SO awful. At least you could wear jeans and be school-spirited I guess? Haha! I started dating K my junior year of hs but I left him out of this. Haha! There were two boys that came before him- both of whom memories make me bury my face in my hands and shake my head! We were so similar! My school colors were also red and black (but we were the Spartans! ), and I LIVED in the band room too. I always say I sold my soul to the music department in high school. I’m not friends with my high school best friends anymore either. Sad how that happens. Grr.. I hate how my high school friendships ended but those girls went down a path that I didn’t necessarily want for myself and hung out with people that wrote me off for my decisions. It all worked out and I’m happy with where I’m at, but I look back at the happy times and miss the friendships that I had! ohhh i love posts like this! i am also very intrigued by people’s high school experience. i really struggled with intense anxiety all through high school and am a profoundly different person than i was then so it’s always interested to reflect on that. i was a peer counselor and that was one of my highlights for sure! my advice: these moments, the good and the bad, will pass. make the most of it, be kind (like you said!) and have fun but don’t make these the best days of your life. life is big and vast and meant to be explored! I had issues with depression in high school, which escalated into anxiety for college… but when I look back it doesn’t affect me much now. (Although I have a journal that I carried with me in hs that I refuse to read and plan to BURN as soon as I can. It has all my not-so-pleasant thoughts that I had when I was 14-17. I don’t want to read it and I don’t need my future offspring to find it and know how… unhappy… their mom appeared.) I like your advice! I need to do this – what a fun idea at this time of year. Yes, yes! DO it!! I don’t think I’d go back to high school, but I would certainly go back to my college days!! Haha! Aww, lovely! It’s funny, because the “cliques” that we were in at that age are often so different from who we wind up being. In those years, our interests and social groups define us, and then you grow up a bit and things become fuzzier. You are absolutely right- things get way fuzzier after h.s. (which is funny because I feel like your teenage years feel fuzzy and limbo-ish when you’re in the moment). Over 1,000 kids- DANG. I loved my friends like family when I was a teen. I mean, I still do. But now I have less than 5 close friends and don’t need that large community like I did in h.s. hey audrey. i stole it, too. thanks for posting about this.